Note list has a powerful "What You See Is What You Get" editor which allows you to add text markup to your notes which are directly shown when you apply the markup changes you want to your note. Bold, Italic, Underlined, Font color and Highlight color. Aside from the option to change the font and highlight color of your text, you can also change the note's background color. 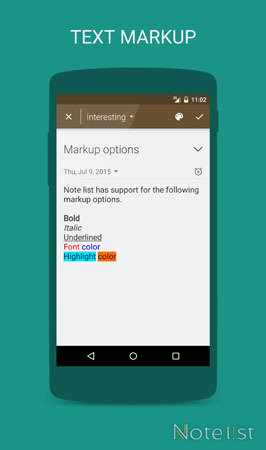 Note list has a variety of colors for you to select from to give your notes the look you want to achieve.